Nothing says “hello, spring” like a new paint job on your boat. If your boat has seen better days and needs a freshened look, it’s time to take it to Anchor Marine Repair. 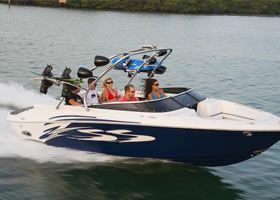 We are your one stop repair shop for all of your boating needs! Just because a boat looks old doesn’t mean that it doesn’t still have a lot of life to give! You may not be able to afford a new boat right now, but that doesn’t mean you still can’t have something shiny and like new! At Anchor Marine Repair, we specialize in boat painting, restoration, and repair. We can turn your old boat into that new, shiny toy that you’ve been anxiously waiting to get back onto the Minnesota water! If you’ve owned your boat for longer than one boating season, you know exactly what we mean. There is so much natural wear and tear on a boat and there’s just nothing you can do to prevent that. Every time you lower that boat into the water and gear up for some fun, it’s likely that your boat will end up with some sort of scratch, ding, fading and any other type of flaw you can think of. So when your boat looks like it’s seen better days, it’s because it has! Giving your boat a fresh paint job can give you that confidence out on the water again (and can save you a pretty penny from buying a new one). Anchor Marine Repair is ranked number one in Minneapolis boat repair. We love what we do and each time we receive a boat, we handle it like it’s our own. Each of our technicians have been with us for over 10 years, making us the most experienced and knowledgeable place to give your boat that needed face lift. When we begin work on your boat, we understand the crucial components of painting. In the paint boating world, every boat technician knows that the preparation is the most crucial part. If it’s not prepped the right way, no boat paint job will ever hold up. Likewise, as soon as that boat is dropped into the water, boat owners will immediately notice bad areas that weren’t prepped properly and the brand new paint applied will start to chip and break off, leaving you with a worse looking boat than before! Anchor Marine Repair will get the job done quickly but will be mindful of the intensity it takes to properly sand down the area and paint it well. We strive to make every boat entering into our facility look and feel better than when it first came in. We take pride in every project we do and cannot wait to get your boat looking like new again! For more information on Minnesota boat painting, call Anchor Marine Repair today at 763-972-3540.